Last month we took a quick trip to the Colorado Mountains for a little R&R. We were greeted with crisp air and Aspen trees turning the most vibrant shade of gold. The combination of mountains, frost covered cabin roofs each morning and cozy fires begging you to dress like a lumber jack turned me into the most obnoxious cheerleader for Fall and all things pumpkin. 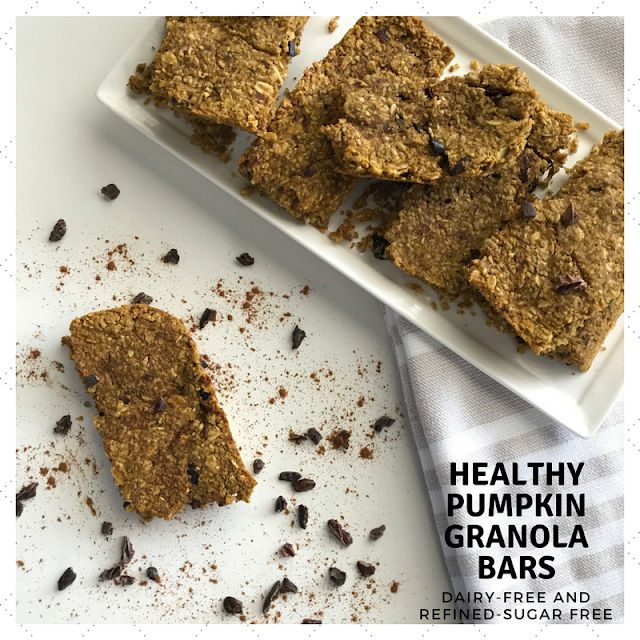 Lucky for Tanner I know myself well, and planned ahead making us these amazing and very healthy pumpkin granola bars. They are dairy-free, refined-sugar free, and toddler-approved. Enjoy! 1. Line 8X8 glass baking dish with parchment paper and coconut oil. Preheat oven to 350 degrees F.
2. In a food processor, place dates (make sure to remove pits) with 2 tbl warm water. Process until they are fully broken down into a paste. 3. In large bowl stir together all dry ingredients - set aside. 4. In a separate bowl whisk together all liquid ingredients then slowly pour dry ingredients into wet until batter is moist. 5. Transer to baking dish and press down firmly making an even surface. 6. At this point you can either chill in the fridge overnight or you can bake on the center rack for 18-20 minutes. 7. Let cool completely before cutting into bars.